The Challenge of the Day. Reluctance to Answer our Life Call. There was a time when for children there time at kindergarten gave pupils their first taste of learning. In these institutions a teacher could give to children gifts that they would use every day of their lives. There is a story of one teacher who taught a child to read. That teacher "loved" her pupils into learning and taught them the joy of schooling. In a way, though, she taught them too well. Their attachment to her left them terribly fearful of going to the next level – to school. Imagine their surprise and chagrin to be called by the school system to move on to another level. Many panicked when they realised this person would not be their teacher forever and that they would have to move up. Of course, she and the pupils' parents reassured them and the students were promoted to the next level. It all worked out. 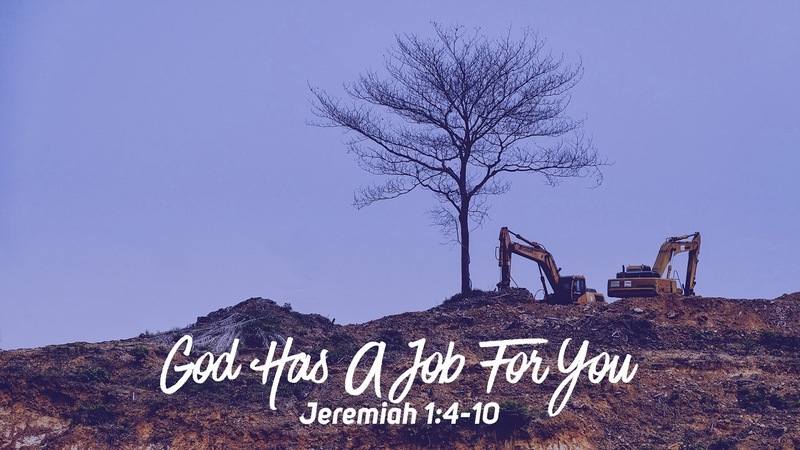 The experience, though, gives us a tiny glimmer of understanding, a sense of what Jeremiah felt as a young man when he was called by the Lord to be a prophet to the nations in this week’s reading from the first chapter of Jeremiah. 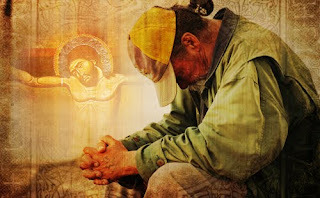 Imagine poor Jeremiah - minding his own business, when suddenly God barged into his life - when he heard God's call to him. Jeremiah heard God calling him to be his prophet, to speak his word to the people. 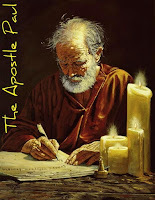 And he was not called to be just any old prophet. No, God would set him "over nations and over kingdoms, to pluck up and to pull down, to destroy and to overthrow, to build and to plant." The Prophet Jeremiah from the Hebrew Scriptures resisted. He was reluctant to obey this call. , However, God wouldn't take a simple, "No," or any kind of "No." So God and Jeremiah engaged in a little dialogue. 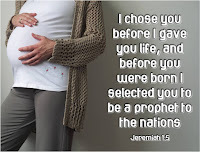 God said, "I picked you out - even before you were born - I chose you to be my prophet." Jeremiah replied, "O, no, I don't even know how to speak. I am only a youth." God came back and said; "Don't say that. For to all to whom I send you, you shall go, and whatever I command you shall speak." Jeremiah pleaded out of fear but God assured him. This dialogue was critical for Jeremiah's decision, in a way similar to that of many other leaders of the Old Testament. Perhaps we should pause to wonder why God has continually chosen the most unwilling characters to do God's will. Why would God have enlisted so young and inexperienced a person as Jeremiah for so immense a task? The obvious answer is that our God calls people for qualities other than gifted speech. We can be certain that Jeremiah's success rested, not within himself, but on God. This is what God promised this very reluctant prophet. We see that all the power and success of Jeremiah's life resulted from this new relationship with God. I'm too old or too young. I don't speak well or know enough. I'm too busy. I can't do that. It must not really be God calling. I can serve, but not now, maybe later. However, if we are willing to engage in a dialogue with God, we might see something else. We are called to look beyond and continue to dialogue with God. This will allow God's spirit into our lives. We are all called into a relationship with God that is challenging. It is we who choose to accept or not accept this call. God tells us, that he will be with us, sustain us, and love us as no other does. We can rest assured of God's support and guidance and strength to sustain us in the task. Some of us respond eagerly and some will be reluctant, like Jeremiah. But, if we engage in dialogue with God, we can learn to respond positively. We too, are assured that the God who calls us remains forever with us. The living God continually speaks to us, through many forms and media. God speaks to us at unexpected moments: through the created world around us; through the hands and voices of other people; and even in the silences of trials and unanswered prayers. The God who has called us is always with us, speaking, if we will listen and, if we will accept it. God, who is always there for us, will give us love and support and nourishment, with the same grace that inspired Jeremiah. Despite any hesitations and uncertainties that may attack us, we can learn from Jeremiah's dialogue with God to be as steadfast as this prophet was in discovering God's call and in heeding it. Get yourself a cup and ball and maybe have some paper in the bottom. 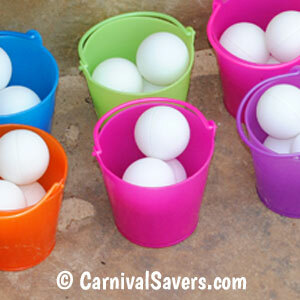 By the way the Ball needs to be small enough to put in the cup or use a container that will take the ball easy. Get someone to watch you very carefully. Then what you do is drop the ball into the cup. Tell your assistant that you are going to drop this ball into the cup. Make sure they are ready and watching. Drop ball in cup. Then ask your assistant which parts of your body you had to use to drop the ball in the cup, (Hands, eyes, brain). Could you have done it with your eyes closed? What if you didn’t have any hands? What if your brain wasn’t working right? By now you realise that you need everything working correctly to make the ball go into the cup. 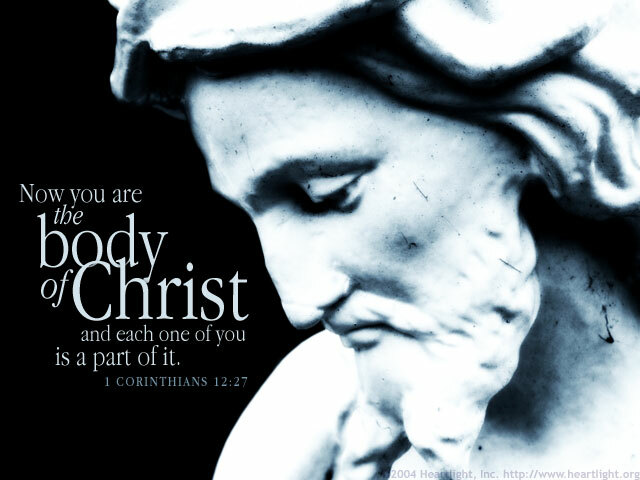 This week our reading from St Paul’s letter to the Corinthians, chapter 12 talks about how all of us are like a body. We all do special jobs, and together we get things done. For instance, which people on any Sunday at worship are important in making the church worship work? Some of those involved include the minister, greeters, readers, intercessors, musician(s), children, the congregation, the stewards and if there is to be Holy Communion someone to get things ready, flower people and so on.) All of these people have their special part to play in making the worship of God work on any Sunday and whenever worship is held. All of us have special talents and abilities to use to share with others which reflect the story of Jesus and God’s great love through his son. Think about the workings of your hands. We can talk about the fingers and the thumb needing to work together to pick up a coin or food. We all have gifts and we help make our community work by using our gifts. In the Church we Christians use our gifts also to let others know about God’s love and grace through his son Jesus. All of our gifts are important and I bet you that you have a gift that you can use. 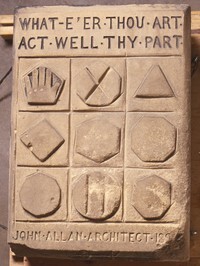 A gift to help you help others in the making of a working community. Maybe today at your family meal you could talk with your family about the gifts that you have for sharing with each other and making the household work. 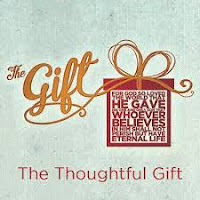 Again for Christian we can talk about how we use our gifts to share about God’s love and his son Jesus. 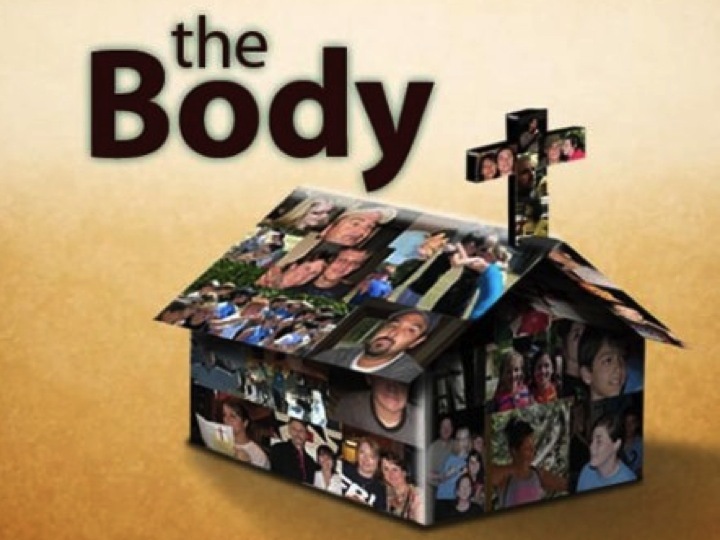 Christians talk of their faith as being of the body of Christ and individually members of it. Each one of us is a part of that body. This body would not work without you, or without all of you. 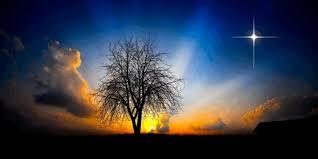 Everyone in this community today is very important part of the body especially of creation. In a lively community of caring people and especially in a caring group of Christians there are many functions shared among those who make up the community. One member can speak in a way that conveys profound things straight to the soul. Another has a gift of helping and caring for people and bringing hope to those who suffer. Yet another can explain ideas with such wisdom that it infuses a new, vital strength into our faith. Still others can have the ability to organise, and another the gift of leading, while another has an understanding of people that is the source of deep consolation for many troubled hearts. You may have seen all this, and yet the one thing that strikes us in such a community is the presence of one spirit in all of them that ties it all together. Since for Christians the gifts are varied expressions of the one Holy Spirit, who distributes them freely, then it is unthinkable that they may be at odds with one another – they are called to and meant to act in harmony. The gifts that are given I have learned, are not meant for personal satisfaction, their purpose is to serve. They are given for the benefit of all, that the fellowship of believers may be extended and encouraged in love. Such gifts cannot give rise to rivalry or disorder. While St Paul considers that there are certain special gifts which affect the life of the community as such, he also tells us that each member has particular gifts for the good of all. 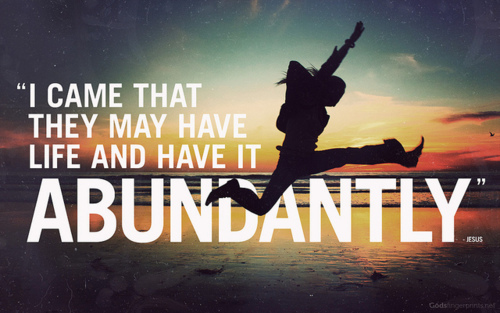 Therefore each of us need to be content and thankful for the gifts that our loving God has given to us. St Paul in this scripture reading from 1 Corinthians 12 presents the community as a body, and asks, “If your whole body was just one eye, how would you hear anything? If it was an ear, how would you see anything? Instead of that, God put all the separate parts into the body on purpose. 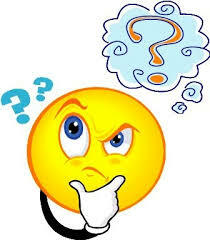 If all the parts are the same then how can it be a body? If you do not seem called to some special task, do not underestimate what God is actually asking you to do in the community or neighbourhood where you are. No matter that the daily grind may seem monotonous and not very meaningful, we all belong to the whole body by belonging to that place. God has chosen this for us and calls us with great love. In Psalm 29 the phrase “the voice of the Lord” is repeated many times. The commentators I read agreed that the phrase referred to the thunder accompanying a storm which has rolled off the Mediterraneanand is hitting the coast, from where it shakes the cedars of Lebanon in the north before it swings south to cast bolts of lightning in the southern wilderness. It was to proclaim God’s power in this world, where the knowledge that such power exists everywhere in everyday events, was an assurance to the people of Israelin exile. There are many challenges to churches today: Some are small and struggling, hoping to grow and not finding their numbers increasing. Others have congregations where there is barely a spattering of people under 75 years of age. Others have problems finding qualified clergy or raising enough money in pledges to balance the budget. Others have significant repairs to do on their buildings and lack the funds for the project. And some are in conflict with broken relationships in need of healing. The scripture readings set in the three year lectionary for this week address the conditions in which so many churches find themselves. In the Isaiah 62 passage, for example, the community had been in exile and lost its vision and focus. Some countries seem to have elected governments that have lost their way and any vision that benefits the whole of creation. 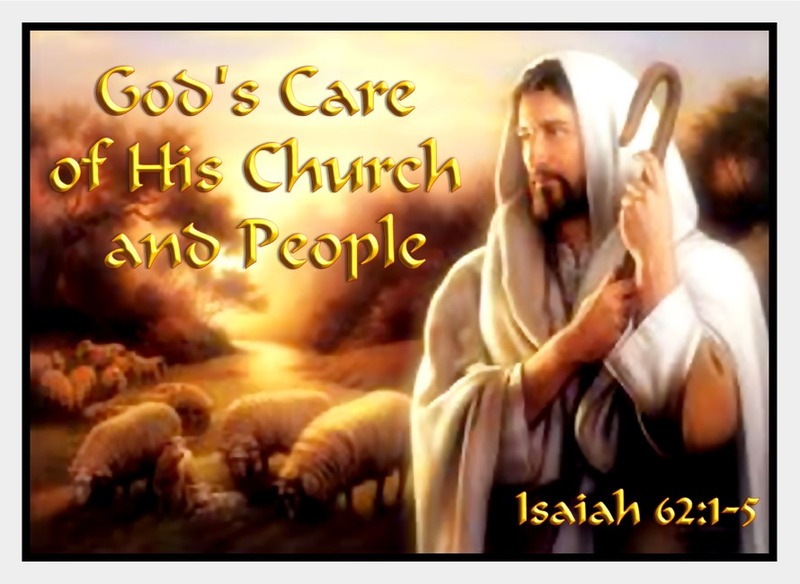 The promise of God's restoration spoken by the prophet in those majestic phrases could well be for today's struggling churches: "You shall no more be termed, Forsaken, and your land shall no more be termed Desolate" (Isaiah 62:4). The theme of hope when there seems to be nothing but a failing future is strong in these passages, and it is a stirring piece of prophecy for all who lose hope. Whereas, St Paul, in Corinthians, takes another tack which is one that is a hopeful sign to churches that are feeling bereft. 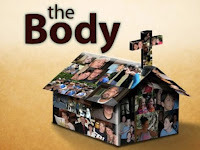 He says there are a variety of gifts for building up the Body (the Church) distributed by the Spirit. All gifts are needed, and every person is gifted for service. In the Gospel from John 2, Jesus goes to a country wedding and takes the ordinary (water) and transforms it into very good wine. When things seemed to be running out, when there was scarcity about to spoil a very good time, abundance took its place and the feasting went on. In our society let alone in our religious organisations we are plagued by scarcity. There is never enough, and another group often seems to have all the blessings while ours has the leftovers. The things that will meet the needs of all humanity seem to be held in the hands of a few and only doled out in meagre amounts at a high cost to the receiver. Yet, if God can take a group of exiles and restore them to greatness, and if ordinary people are gifted by the Holy Spirit with what it takes to be the Church, then how can we dare say we do not have enough without insulting God's promise? Throughout the world people are building faith communities and communities with nothing in terms of wealth. They succeed because these people have caught the spirit of the Gospel where God will use what appears to be the lowly and unimportant to accomplish it. So, if you are waiting for better days in the world and especially in the church know that they have come. If you are waiting until the right leader appears know that the time is now. If you are feeling low because of the things you don't have, take an inventory of the assets you have. Most people are surprised when they discover the talent that is there and the resources that are at their disposal. The transformation of the lives of women and men is not expensive in terms of the world; and in God's economy, it is free. Our task is to lay aside the things that daunt us, make us afraid and captive to scarcity. Putting on the garment of light in Epiphany means moving into a sharing mode now. So, rejoice with Isaiah that God finds your community or church worthy of delight. Celebrate the gifts given you by the Spirit to move forward in life. Vow to be part of the work of the Gospel which transforms water into wine and God's people into a holy communion of faithful people. Once there was a church that began to say it was dying and in many churches this is being faced. Some of its members had moved away in a very short time. Other members had become unhappy and quit coming. There was a faithful core, but they were burned out from assuming the many duties of running the church with fewer folk to help. One woman spoke for many at the annual meeting when she said, "If we don't do something there's going to be a funeral -- mine!" Three people in the congregation decided to pray daily for renewal and growth. At the end of a year they discovered that there were six more people in the congregation, there was a vision about starting a day care for those in a low socioeconomic people and a person who had agreed to run it and there was a new sense of energy among them. Now for many congregations this may not mean doing things as they once did or even having a church building. 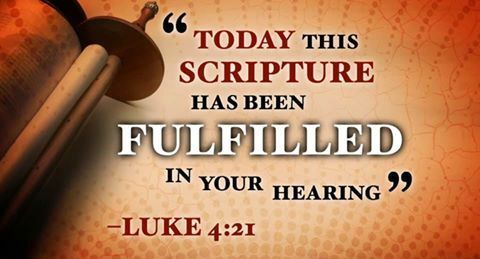 For many it will mean listening for where our God wants us to be and where our God offers resurrection. At meeting they asked to speak to the assembly and told the people not to give up hope. They believed God was waiting for them to realize they had to be dependent on God's grace alone before they could be renewed, and they testified that their faithful prayer had been answered. "When the wine gave out, the mother of Jesus said, 'They have no wine.' Jesus said to them, 'Fill the jars with water.' “If the Lord can take what we have as abundance to make what is needed all we need to do is ask, and abundance is ours to behold and taste. Marked and Signed as the Beloved. 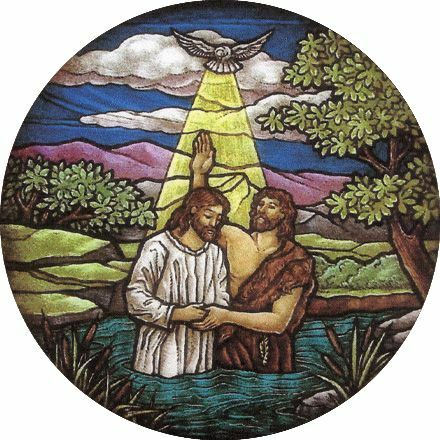 Today in the Churches Calendar many remember the Baptism of Jesus and do so as a big event. There are a lot of things that come together in Jesus' baptism. There are a lot of things that come together in our Baptisms. First, there is John the Baptist. John is a wild man. He came from the wilderness. He dressed in camel hair but it wasn’t an elegant camel's hair coat as we know it today. He ate locusts and wild honey. This is hardly a conventional diet, either then or now. His sermon said, "You den of poisonous snakes, who warned you to flee from the wrath to come?" This was not an approach designed to gently convince people that they should come to a conclusion about God in their life. The people who came to John for baptism were desperate to change their lives. The crowd is identified as a mix of tax collectors prostitutes, soldiers and religious people like the Scribes and Pharisees. The Pharisees may have been there to spy. They may have been there to determine whether or not John was the Messiah. Most likely, they were desperate to know the move and peace of God just like the obvious sinners. John said he wasn't the Messiah when he was asked if her were. John said "Jesus is." John's baptism was a washing for repentance. And he believed Jesus didn't need to repent. So, Jesus' baptism changed the meaning of baptism. As Jesus was praying after the immersion, the heavens opened. The Holy Spirit came down on him in bodily form, like a Dove. This is a strange event. Something outside of the normal is happening. Then a voice, a thunderous voice said, "you are my son, the Beloved, with you I am well pleased." This is God's anointed. God is well pleased, God loves him. He is even identified as God's son. Presumably, Jesus then looked out and saw the gathered tax collectors, prostitutes and other sinners who had been baptised with him. These are the things that happened to Jesus in baptism. He was given an identity...God's son.He was identified as the focus of God's love.He was identified as being very pleasing to God.He was physically given God's Holy Spirit.He was joined into a new group, those who were baptised by John. Jesus changed what baptism means for us. We receive the same gifts when we are baptised. 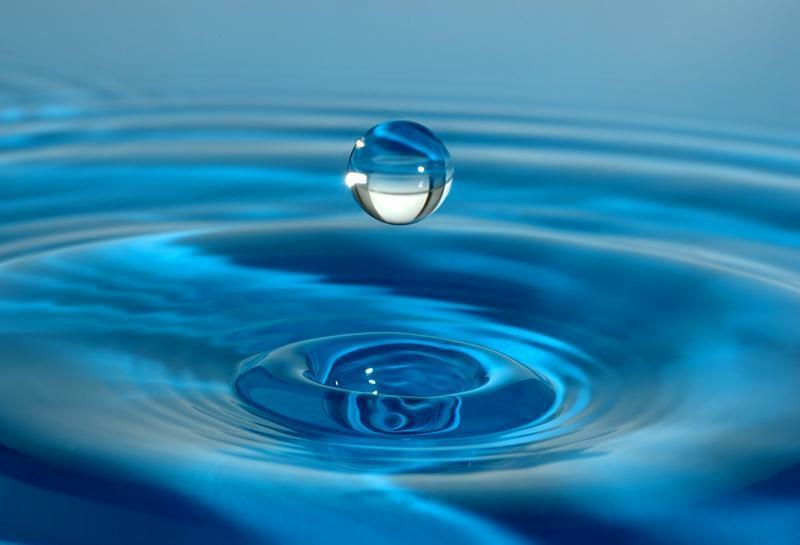 We receive the gift of water. Water is life. Without water there is no life. We are given an identity. The meaning of our name is transformed. It is now a name given by God. Some of us have had the experience of being a sponsor, a God parent or parent, at a baptism. 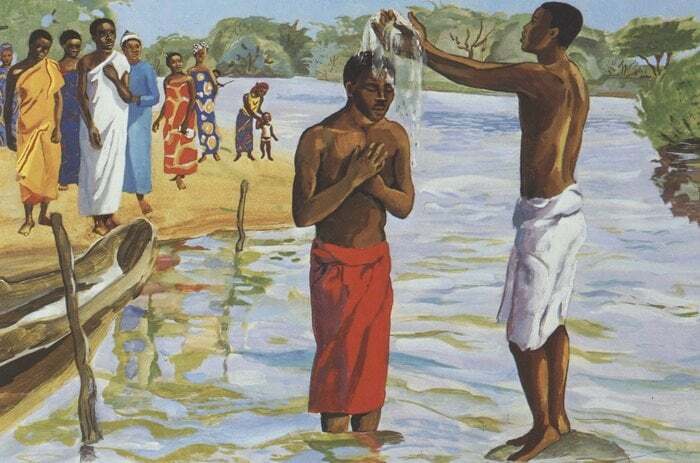 When the name is pronounced and the words "I baptise you in the name of God, Father, Son and Holy Spirit are joined to the gift of water a new person or creature is proclaimed. A child of God, where life with spirit and power is held up. The new person, known as a child of God, is in our midst. Well for Christians when a baptism takes place we are named as beloved by God. In the same way that God announces that Jesus is beloved, we are announced as beloved. We are given a community. We join with the people present at our baptism who are baptised and with everyone who was ever baptised. In fact, one of the ways we know that God loves and accepts us just as we are is because God loves and accepts other people who are as messed up and as sinful as we are. For Christian people baptism is a big deal. It is a chance for people who are desperate to change their lives to gain the same identity, in God's eyes, that Jesus has. It is in a way, the event that leads to salvation. Jesus bought us this gift and God gave us this gift. Also the Holy Spirit sustains us in this gift. To quote that wonderful song from ‘Life of Brian,’ “always look on the bright side of life.” God has given us a magnificent gift. The gift is the unconditional love and presence of God in our lives. While we are at Tauranga Aotearoa (NZ) and relaxing, I thought I might share a story that comes from the Epiphany which I enjoy. This is namely the story of the Magi, wise people from a camel’s point of view. Ships of the desert, my eye! Being a beast of burden is probably not all it is cracked up to be when old nothing but dust for brains Adam named us camels. It was the same when Isaiah proclaimed that a multitude of us would cover the land of promise bearing peoples and gifts from all corners of the earth to come and see the brightness of the light of God's people shining through the thick darkness covering all the earth. But still, without the bunch of us lugging all the supplies and tents, and also those precious and somewhat odd gifts for a baby shower, the Wise Ones would never have made it by the twelfth day. It was by today actually, all those years ago. Well I’m one of the lucky ones who only had to carry one of the Wise One's. By the time we got to Bethlehem, it was no longer a town bustling and bursting with people and commerce like it had been for those few days of the census. It had returned to its sleepy self after everyone had been counted and gone home. When we got there, the place was empty. There was just a man, a woman, and between them the baby. But there I go getting ahead of myself again. Thank goodness for the camel boys who saw to it that we were fed and watered and had a rub down. This was because the Wise Ones as usual had their heads full of the stars. All the time they were looking out at them. If they were not gazing at the stars they were talking about them, charting them, interpreting them, and searching for this special person. They were searching for the one that would relieve them of their endlessly restless and yearning spirits. The wise one’s searched the heavens and earth for something they kept calling "the truth." The rest of us in the caravan saw to it that life was lived and everyone was taken care of. They often missed the most interesting exciting parts of the journey. They were so absorbed and preoccupied with their own concerns and interests. Like the mouse who smuggled herself into the saddlebag of Gaspar's camel, Lucky. This was a teenage mouse that had had a terrible fight with her parents. But there I go again. I'm getting off the point. So where were we? Oh, yes; certainly not at that dreadful King Herod's place. There was plenty of company for all of us camels amidst his livestock and barns, and plenty of water and grain and other good things to eat. But even we could sense the terrible feeling of darkness and death that surrounded his part of the Roman Empire. And who was this Caesar he kept talking about? Herod seemed troubled to hear the Wise Ones talk about the stars and a new King of the Jews and asked for directions to the place where the child lay. Herod didn’t know the way but wanted us to return and tell him where the little one was so he could go there to pay his respects. It wasn't what he said but how he said it that made even the fleas on my humps crawl with uneasiness. Surely there must be another way out of here, we all thought. And as it turned out, we did head off in a new direction. We found them at night and it was very cold. The smell of the hay was very sweet, and the cattle's breath, like ours, came out in little puffs of mist hanging in the air. Of course I a camel wasn't supposed to come into the place where they were. In fact, it was such a tiny little cave of a place and there wasn't much room. We had come so far, travelling for so many years to find something, someone, somewhere. It seemed possible that we really might have to search no further. I figured it couldn't hurt if I just stuck my head in for a peek. So while they were unloading the gifts off the back of my cousin, and the Wise Ones were still consulting their charts and graphs to make certain that this truly was the one they were searching for, I stuck my head in. Well, it was a bit surprising. The scene was so ordinary. I don't know what I had expected, but after years of carrying these Wise Ones and all their gear and supplies all over the place. I guess I thought there would be crowds, and family, and all kinds of hoopla. I mean, even when a new camel is born amongst the herd, there is more attention and excitement as the new baby tries to stand for the first time. There was none of that in this little place in Bethlehem. There was a man, a woman and, between them the child who at the glance I caught, seemed to be a King." I could see that this little child was true light itself. It is really curious how little babies like this one cannot even get up on their legs the way we do. They just lie there, so, still and vulnerable. Even I could see that stars might bow down before this one, he could teach creepy old Herod a thing or two about being a king. I could see that the heavens and earth and all creation were somehow about to be made new by the presence of this one baby in the hay. It's too bad the Wise Ones did not seem to see all that. I mean they put their gifts in there, and bowed down on bended knee and all. But then it was back out the door, and looking into the stars again. Soon we were being loaded up and herded down the road and out of town. 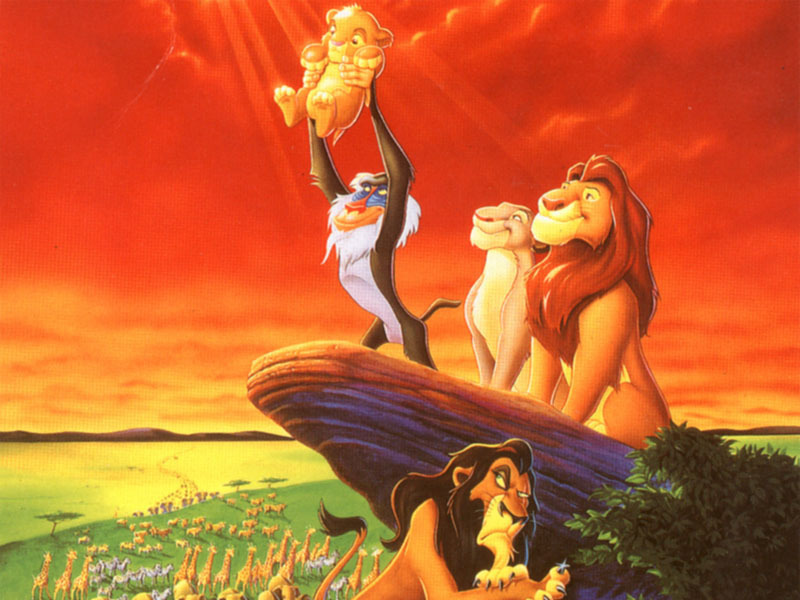 All of us except that mouse who stayed behind moved on. She just could not bring herself to leave those people alone. She was not going anywhere. She was staying right there with him, the one born to be King. She wanted to live the rest of his story! Just that glance, a peek in the door was enough to know that this Jesus reveals to you how much God watches over you and loves you. Even I could see that this Jesus calls us to follow him so we might do something beautiful with our lives and bear much fruit. Even camels! The one thing I saw that night was that the world needs you. Jesus needs you. They need your love and your gifts and your light. Isn't that the funny part of it all? The Wise Ones are off all the time looking at the light in the stars, when the light that is the light of the world is right here in the midst of us. He shows us that. Any camel with eyes could see that! Know, my sister, my brother, that there is a hidden place in your heart where Jesus lives and his light shines! This is a deep secret that even the Wise Ones overlook most of the time. Let Jesus live in you. Go forward with him into the whole world. 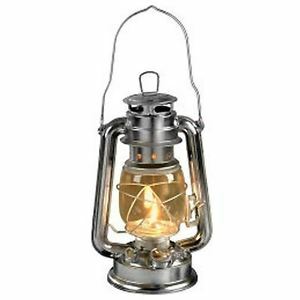 Let your light shine, for the light that is the life of the world is coming into the world. 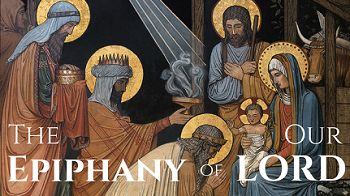 Keep looking at the babe in the manger, offer him your gifts, and you will see all that there is to know and see! You will then see some more and then even some more. And who knows, maybe if we all offer as much as we receive, we just might in fact make it through the eye of a needle! Kaye and Andrew visited Marsden Road Uniting Church this week where they are always very welcome as they bring with them their message of hope. Today Kaye delivered the sermon and introduced it by placing the readings for today, from which she preached, in the context of the UC lectionaries for 2018. This is important for us to understand its place in our teachings. Then Kaye showed us how Luke had deliberately used key words to stress the significance of the account in Luke, (chapter 2) of Jesus in the Temple. Again, these choices are not random and point our attention to the main ideas. “Jerusalem”, where this account takes place is central to Jesus’ life story and many crucial events take place there. The “Passover” is central to Jewish practice and the time when the very important stages of Jesus life take place. Jesus was “twelve”, a number significant in many ways for Jews. Jesus was missing for three days, another significant length of time for the Christians who followed the teachings of the ones who first responded to Jesus and the “Temple” which was central to both the Jewish and a Christian stories in both a concrete and representative way. Kaye also raised the use of “your father” in reference to Joseph and My Father’s house in reference to Jesus relationship with God. By pointing out and explaining these and other references, Kaye set the scene and its significance within the Jesus Story. Using this foundation Kaye was able to use the parallel between how we move off from our Christmas celebrations back to our everyday routines with how we move off from our contemplation of Jesus’ birth too quickly. Not only do we move off from our special Christian celebrations but we do this each Sunday as well. When we arrive home on Sunday after church, often lunch becomes the focus of our attention, rather than contemplating the service of worship we have just shared. Like any important experience, it would do us all a service if we sat and thought through that experience later. The implication is to stay with the account of Jesus’ birth and childhood and consider their importance to us. Kaye took this time to ponder the story in the reading. Friends and family travelled together to Jerusalem for the Passover, in one way, an exciting time to catch up with everyone. But once the festival was over, the people headed home, as we do after Christmas. But something happened to break the festive mood, Jesus was missing. Most parents have experienced the panic, even only for a short time, of not knowing where their child has gone. Finally, after a long search, they found him, sitting in the Temple, nonplussed as to why they wouldn't know where he would be. But his answer, including the words “My Father’s house”, stopped Mary in her tracks. And she continued to ponder those words. What does it mean for us to be in “my Father’s house”? 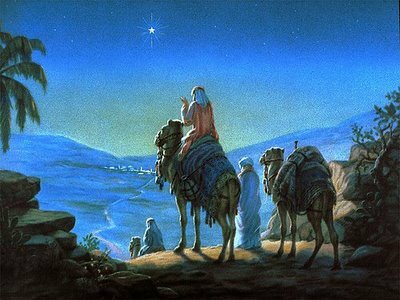 What is the significance of the events of the first Christmas and of the youthful Jesus to us. And what does it mean each Sunday as we gather to worship together? These gatherings aren't just habits but have deep meaning which can only be appreciated when we think through them later. We were thankful that Kaye brought our attention to the need to sit with these thoughts, and to ponder them, to find their deeper significance to our lives.